AS JOBS IN the comic world go, this is one of the most prestigious. 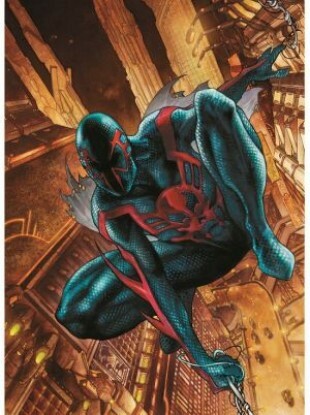 Irish artist Will Sliney is to draw the next Spider-Man series, entitled Spider-Man 2099. Writing on Facebook, Sliney described it as an “absolute dream gig”. Sliney, a graphic artist who lives in Cork, has worked with major US comic publishers on the Star Wars Clone Wars series and Fearless Defenders for Marvel. Spider-Man 2099 is set in the future when a geneticist called Miguel O’Hara – who is half Irish – is attempting to recreate the abilities of the original Spider-Man when his DNA is rewritten with a spider’s genetic code. In the new series to be published this July, O’Hara is adapting to life in the year 2014. Marvel said on its website that O’Hara will be on an undercover mission inside Alchemax, the giant corporation where he eventually gains his powers and which currently employs his biological grandfather. The series is written by Peter David, who wrote the original Spider-Man 2099 series when it first appeared more than 20 years ago. The series became a fan favourite during its four-year run. Sliney told Marvel.com that he was looking forward to showing “how a man from the future can really affect present day with the knowledge and background he has coming from the future. Most of all though, I am delighted that the character is back, and I feel honoured to be a part of this now legendary hero’s story that Peter created. Sliney wrote and illustrated a graphic novel last year about Cú Chulainn which became the first Irish-published graphic novel to reach the top 10 bestseller list in Ireland. Email “Irish artist to draw new Spider-Man graphic novel”. Feedback on “Irish artist to draw new Spider-Man graphic novel”.